If you’re like most first-time gold investors, then you may not know exactly how to invest in gold – you just know it’s potentially one of the best decisions you can make for your portfolio. Investing in precious metals is actually a lot easier than you might think. You just need to know where to make your purchases and how to choose the best investments for your specific needs and goals. As with any type of investment, you should always do your research and have a good understanding of your options before getting started. By seeking the advice of a professional, you can maximize the potential of your investment strategies and ensure that those strategies make sense for your situation. To help you understand how to invest in gold the right way, let’s look at some of the most important steps you’ll need to take. The importance of working with an established precious metals firm cannot be understated. This company will ultimately factor into what your investment options are, how simple the process is, and what kind of expertise you receive. Look for an experienced company that has a proven track record of working with investors like yourself, as well as knowledgeable staff who can point you in the right direction. One of the first steps to understanding how to invest in gold is to consider why you want to invest and what you hope to gain from it. This will help you and your precious metals specialist determine which options might be best for you. There are actually numerous reasons to invest in gold. By diversifying your portfolio with gold, you can safeguard your investments from the volatility of the stock market and also shield them from the devaluation of the dollar. Plus, with analysts predicting bigger gains in the years ahead, the growth potential of gold makes it attractive to nearly any investor. 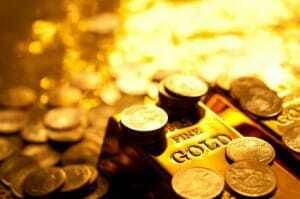 Are you hoping to invest in gold bullion or numismatic coins? How about an IRA that’s backed by gold or other precious metals? Each option has its own unique advantages, which is why it’s so important to do your research. Take the time to understand your options and talk to your precious metals specialist about creating the best plan of action for your goals. Investing in gold should be a simple process that is both rewarding and enjoyable. If you’re confused, uncertain or feel pressured by an aggressive gold dealer, then it’s time to take a step back and reevaluate your options. This is why Step #1 is so important. By partnering with the right precious metals company, you can have peace of mind knowing that you are getting assistance from professionals who are looking out for you and your future. If you have questions about investing in gold, or you would like to get started, contact the professionals at Birch Gold Group. We are a leading precious metals company rated A+ by the Better Business Bureau. Our knowledgeable specialists will walk you through the process of purchasing gold, and we can help identify the right options for your situation. We offer a number of investment options, including gold IRAs and gold coins, as well as other precious metals including silver, platinum and palladium. Fill out the form on this page for more information or call us at (800)355-2116 today.